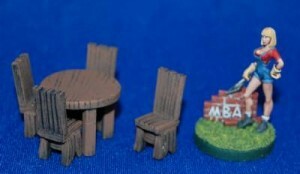 Miniature Building Authority gives your minis a place to sit down and have a nice meal with their new table and chairs set, available now. Our new item, Round table and (4) Chairs is now available from Direct Terrain here at the Miniature Building Authority. The table and chairs are made of metal and come unpainted. This is yet another great accessory for any of our buildings, or other terrain areas where you need your party to sit down and stay for awhile. Figure is not included.